As one of Britain’s most exclusive and iconic castles, Alnwick Castle is an incredibly exciting venue for a wedding. The castle is famous for its breath taking views and for its stunning lawns being the filming location for some of the most iconic scenes in Harry Potter. The Alnwick Castle Guest Hall lends a historic atmosphere to wedding celebrations, with its beautifully restored beamed roof and stone archways. The castle has a guest capacity of 500, exclusive use, and is fully licensed. For more intimate affairs, Alnwick Castle’s private parklands provide stunning scenery and a secluded location to commence your celebrations. The castle offers two beautifully exclusive venues situated within the privacy of Hulne Park, Hulne Abbey and Friars Well. Explore Alnwick Castle here. Achieving the dream of bringing the allure of French chic right to the heart of Northumberland, the Le Petit Chateau offers itself as a fairy tale wedding venue for any couple after picture perfect wedding in Northumberland. Boasting cascading curtains, crystal chandeliers, antique gold furniture, a giant marble fireplace, a fantastical fire on water feature and much more, your guests will wander awestruck through the majestic grounds and boutique bedrooms. Le Petit Chateau has a generous maximum capacity of 160, offers accommodation for 60 guests, and stunning outdoor space. Explore Le Petit Chateau here. Situated within unspoilt woodland and overlooking beautiful parkland towards the coast, Charlton Hall is a stunning, Grade II listed rural country house within Northumberland. The hall is filled with eclectic yet decadent interiors. Bold colour schemes compliment imposing Tom Dixon pendants, mismatching fabrics, tapestries and thought-provoking statement pieces. The venue hosts a variety rooms, including an elegant drawing room with marble fireplace and a stunning breakfast room with views towards the coast. Charlton Hall can also cater for up to 120 guests, accommodate 18, and its spectacular courtyard provides the perfect outdoor space for drink receptions. Explore Charlton Hall here. Described as a place of fun, fantasy, love and laughter, Newton Hall is a luxury hotel at the heart of Northumberland's spectacular coastline. The hotel is situated half an hours travel from Newcastle and 90 minutes from Edinburgh and offers a host of fun and exciting activities for guests to take part in to celebrate your big day from serene walks to extreme sports! This unique venue is totally tailored to your taste and your vision by offering bespoke services set to an exquisite backdrop. Newton Hall offers a ceremony capacity of 150 people and can provide 21 double bedrooms as accommodation. Explore Newton Hall here. Healey Barn is a wonderful new wedding venue in the Northumbrian countryside, near the small village of Healey, 6 miles south of Corbridge in the Tyne Valley. Healey Barn is made up of a collection of stone farm building situated within a gorgeous courtyard. The main building, the Long Barn, has a spectacular oak “raised cruck” roof, three giant candelabra, wall-mounted candle holders, a fairy-lit ceiling and, of course, a barn-sized stone fireplace. This creates an enchanting and romantic atmosphere, perfect for Civil Ceremonies or for the arrival point after a Church Wedding – and this later becomes the dance floor! Explore Healey Barn here. Doxford Barns is an unusual wedding barn venue situated on a private and secluded country estate in the unspoilt Northumberland countryside. They provide complete exclusivity to you and your guests for up to three days, with accommodation on-site. The spacious 500 acre farm is like a retreat, offering up to 5 different ceremony areas, including a beautiful lake for intimate ceremonies and photography. Characterised by 18th century oak and stone barns, the venue is adorned with festoon lighting to create the wow factor every bride and groom deserves on their big day. Explore Doxford Barns here. Briery Wood Country House Hotel in situated just moments from the shores of Lake Windermere in Cumbria and set on seven acres of beautiful secluded gardens. The venue boasts all the comforts of the home set within an exquisite country house. This venue has an extensive history of hosting weddings so has an abundance of experience in making your wedding perfect! The Hotel is surrounded by spectacular landscapes, lakes and fells, can host a ceremony capacity of 80, and a dining capacity of 140. Explore Briery Wood Country House Hotel here. Wynyard Hall is a magnificent 12th century country house situated on 150 acres of private parkland in the gorgeous countryside of County Durham. 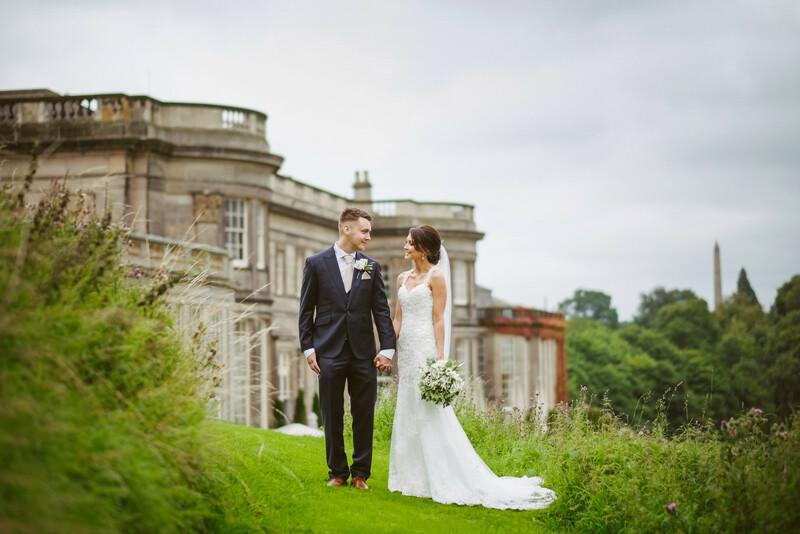 Wynyard Hall offers the impressive credential of hosting weddings for over 800 years! Wynyard Hall is one of the few wedding venues in the country with its own Chapel and breath-taking State Rooms boasting many of their original period features. The luxury accommodation includes 19 beautiful bespoke bedrooms and 5 charming hot tub cottages, each sleeping up to 6 guests. Explore Wynyard Hall here. Set in a unique Durham location, surrounded by 350 acres of private grounds, Ramside Hall boasts 127 luxury bedrooms, two 18 hole Championship golf courses, a purpose-built luxury on-site spa complex & four award winning restaurants. Ramside Hall can create bespoke weddings for small groups or groups of hundreds of guests making it a versatile and exciting wedding venue in the North East. Ceremony capacity peaks at 400 guests. Explore Ramside Hall Hotel here. The National Glass Centre is a truly unique and wonderful wedding venue with riverside views of the River Wear. Modern, bright, and airy spaces offer floor to ceiling windows with views over the River, providing you and your guests with a spectacular setting for your celebration. The National Glass Centre is a truly artistic and stunning venue. Ceremony and Dining capacity peaks at 120 plus an added bonus of corkage is available! Explore the National Glass Centre here.